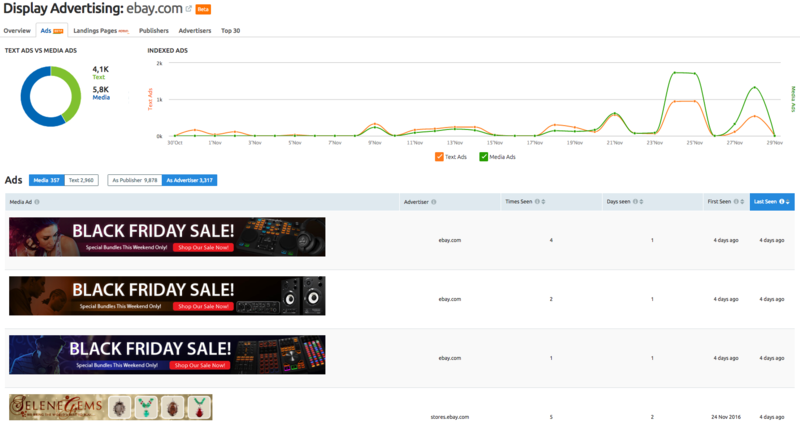 We’re excited to inform you that the new updated Ads report is now available as a separate tab in the interface of our magnificent Display Advertising tool. Previously, some users may have experienced difficulties when searching for a list of ads by some specific advertisers. Moreover, if a required domain was an advertiser and a publisher at the same time, you had to switch between different reports. Everything is much simpler now that all the necessary data has been brought together in our refreshed Ads report. In this new report you can see comparative analysis of media and text ads, which will allow you to draw the appropriate conclusions regarding specific advertisers. In addition, two more columns have been embedded for your convenience: the ‘Days Seen’ column, which shows the number of days an ad has been seen, and the ‘Advertiser’ column, which shows the advertiser of the desired ad. Use the filtering and sorting controls to manage and analyze your data in no time.